New York's Upper West Side is now host to a new Club Monaco store, and entering their newest location last night, I was amazed at the reception that awaited me. To my left was a cute waiter offering me white wine or prosecco, to my right was another cute waiter offering me cheese and fruit, in front of me a nicely revamped store layout. 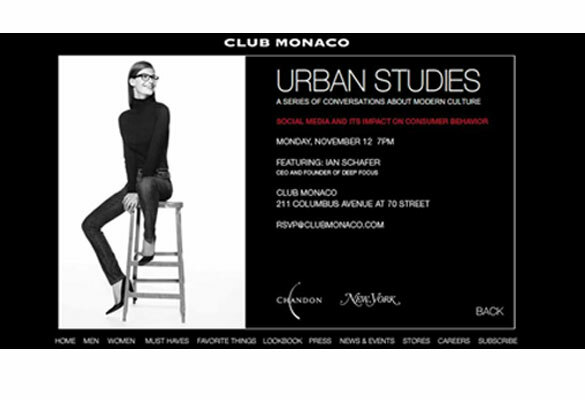 I went with the prosecco and made a b-line for one of the last available seats at this second installment of Club Monaco’s Urban Studies Series, entitled "Social Media and its Impact on Consumer Behavior," presented by Ian Schafer – CEO and founder of Deep Focus. I can’t help but raise my proverbial glass to Club Monaco for creating this classy event which provides current and useful info to the knowledge-hungry. I listened with rapt attention to Ian Schafer’s engaging presentation which was not only relevant and informative, but also quite witty. I giggled several times (no it was not the glass of bubbly), and walked away with lots of food for thought on the increasing connectivity of consumers and how one day our worlds—and our buying patterns—may all just meld together.